When wireless charging becomes the law of the land, Denso will be ready with an in-car solution for everybody. The company revealed its workings on a Qi standard compatible charger for vehicles, and the first batch went into this year's Toyota Avalon Limited model. “As smartphones become more widely-used in vehicle connectivity, this new product provides a convenient charging solution that is needless of cords and connections,” commented Hiroyuki Wakabayashi, Executive Director responsible for DENSO's Information & Safety Systems Business Group. Nokia Lumia 920 owners should be rushing to preorder the Toyota Avalon, as well as Nexus 4 and Droid DNA ones, while the Optimus G Pro and Galaxy S IV are also poised to support the Qi standard out of the box. Check out the eBin demo in the video below. 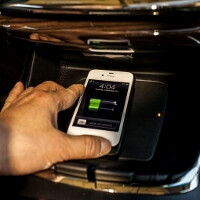 Doesn't the Dodge Dart already have this technology? So technically its not the first? World first car fire cause by wireless charger. This won't work for me. I place my phone in the mount that is mounted on on my car's air vent. What I need is a phone mount that I can attach to my air vent that can also wirelessly charge my phone when I mount my phone in the car. Placing my phone on the pad is useless if I am using my mapping app while driving. I would rather not have to look down to see the route/traffic info. I need it on my vent so it is easier to see the display on my phone while driving. The only problem is when its on the charging pad and I plug in the mic to stream music through Pandora, it gets super hot! So I don't think you'll be able to do too much besides charge the phone, which is ok and still cool. Now the technology is changed and every one want to switch to wireless technology it more convenient and comfortable for each one. just place your devices and phone on charger surface and plunged the power and you can see charger will automatically started and using dock you can charge your phone while your driving on long way, and I have one and i love it because company provide free orientation charger means you can place your phone on charger surface in any direction no need to set on fix...In dock setup you will get a holder which help to protect your charger and phone fall down at the driving time.I bought from CHOETECH amazon shop but the prices is difference in UK and USA shop in little way because choetech launched new series for UK Users.